Skeletons meet Serendipity. Random stories discovered in family history archives. SCISSORS, SPOONS, CLOTHES PEGS, AND MEAT HOOKS. It's surprising the stories that can be discovered from a random image. This one comes from the Facebook and Instagram pages of Tansley & Co., vintage merchants in Maldon, Victoria, Australia. 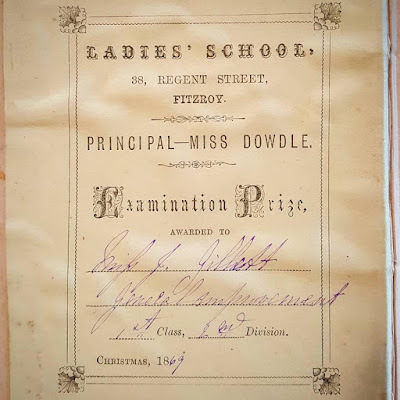 It is a prize presentation plate in a book entitled "Heroines of the Household" * given by the Ladies' School of Fitzroy (Melbourne) to a Miss J. Gillett for "General Improvement", and dated is Christmas 1869. Jane Gillett was born in Melbourne on 5 October 1853, and baptised at St Peter's Church, Eastern Hill, on 12 March 1854. That record shows that her father, Edward, had the occupation of "Land Owner" and her mother was Eliza. The family's address was Napier Street, Collingwood. Further research shows the family continued to live in Napier Street for many more years and that it was later incorporated into the suburb of Fitzroy. In the past, the condition now known as post-traumatic stress disorder (PTSD) went by various other names - shell-shock, battle or combat fatigue, even hysterical neurosis. It was rarely treated, being considered shameful, something to hide and never admitted to. Untold thousands of men who had been through the trauma of war would have been impacted by it to some degree. Combine this with a genetic tendency to depression, plus a perfectionist or conscientious personality, and there is a recipe for major difficulties at some stage. Inspired by a death notification discovered while indexing archives for familysearch.org, I went in search of the life story of one man who reached the tipping point after an impressive career military duty and service but who probably feared loss of control above everything. Quite a lot about a person's background - and even character - can be discovered by something as simple as the details on a marriage entry - in this case, that of his parents. I blog as Regina of Arbeia but I'm also author Marina Maxwell. Lt. Col. Claud Hamilton Griffith Black D.S.O.